On Wednesday November 4 it was announced by U.S. Attorney Patrick A. Miles, Jr. that 40-year-old Yashica Toshian Tucker of Grand Rapids had been sentenced to one year and one day in federal prison after filing a false tax return with the IRS (U.S. Government). Special Agent in Charge Jarod J. Koopman of the IRS – Criminal Investigation joined in the announcement. 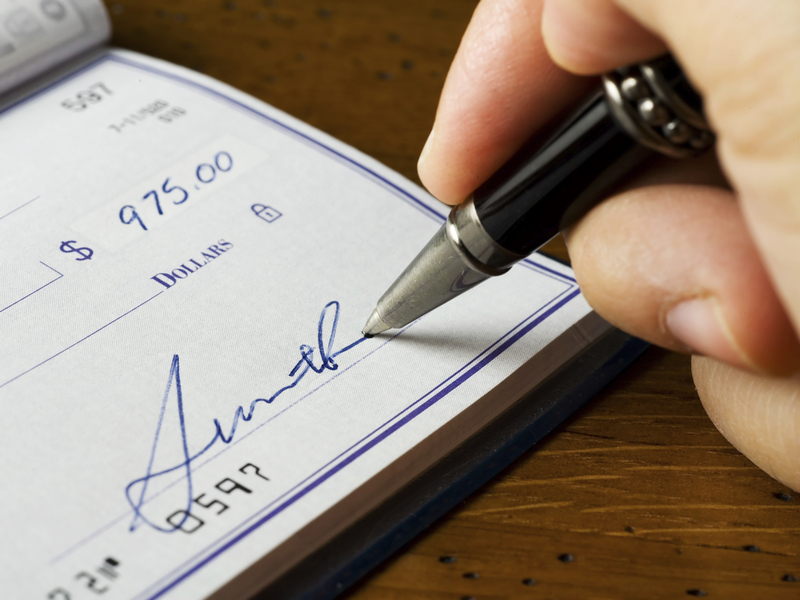 Close up of a hand signing a check. Please note that the signature is fictitious. Tucker pleaded guilty in August to one of 10 counts against her involving the filing of fraudulent tax returns on behalf of others. This activity occurred beginning in January of 2011 and continued until February of 2013, according to news reports. The total of the false tax returns filed with the IRS was $71,606 according to an indictment filed in U.S. District Court in Grand Rapids. Tucker was charged in April of this year. Tucker said in a plea agreement that she told clients she was an experienced tax-return preparer. For a fee, she filed tax returns for others, and in one instance claimed the filer earned more than $16,000 in 2010, an amount she fabricated. On that return she sought a refund of more than $7,000, and received $1,000 for her services from the client. Chief Judge Robert J. Jonker held Tucker responsible for knowingly filing the numerous false federal tax returns at the sentencing hearing last week, and for fraudulently claiming refunds in an amount of $196,784. In addition to the federal prison term, Tucker was ordered to pay this amount in restitution. She agreed to file tax returns for no one other than herself, and upon her release from prison will be supervised for a three-year period by the U.S. Probation Office, during which time she will not file federal tax returns on behalf of others. Filing fraudulent federal tax returns is a serious crime that will result in severe punishment for those convicted. Had Tucker not pleaded guilty, she would likely have faced a prison sentence that was much harsher. White collar crimes such as embezzlement, financial crimes against the government, money laundering, and others typically do not involve violence, however the punishment can be just as severe in many cases. Anyone who is accused of filing false federal tax returns or any offense involving financial matters must consult with a trusted Michigan white collar crime attorney who will thoroughly review your case and work to determine all possible legal options so the best possible result can be reached, and the damage to your life minimized.